-Located 12 km from Bagnères de Bigorre famous spa town with cultural and architectural wealth, you will find shops of all kinds, supermarkets banks, thermo-ludic establishments, casino .... where you will have to make a stopover. 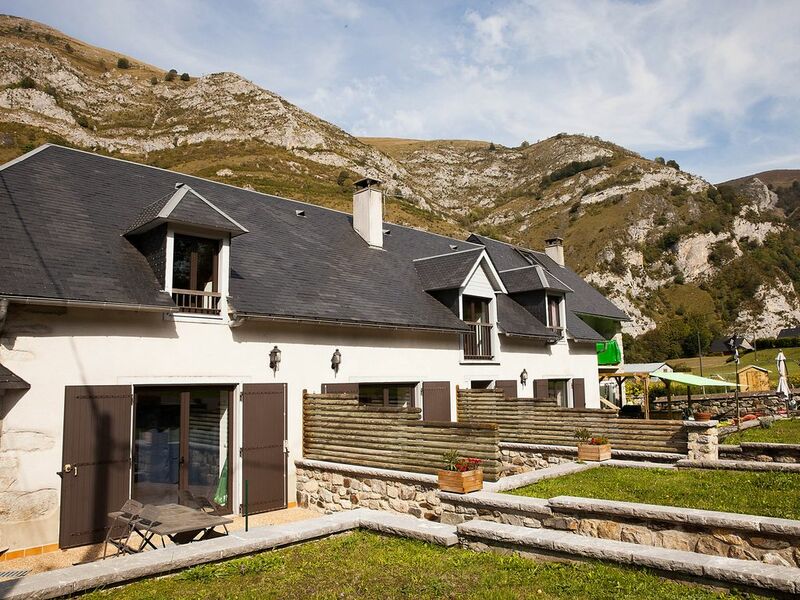 That said, Ste Marie de Campan is endowed with its few shops open summer and winter; pizzeria, grocer-bar that will offer you all regional products and will help you out of everything, "at Seb", sports shop, it will provide you all the necessary panel related to alpine activities. We are located only 1 km from this place which is the branch of two unavoidable directions offered by the destinations of the high Pyrenees. On the one hand, the famous peak of the South of Bigorre, La Mongie (its ski resort), and the famous Col du Tourmalet which will plunge you in its neighboring valleys. On the other hand Payolle, our little Canada, a Nordic ski resort, the Aspin pass going to the Arragnouet tunnel that will take you to the Spanish regions with their completely different arid landscapes, without forgetting the many picturesque villages. that you will meet throughout your journeys. The cottages, the "Montaigu", "Arbizon" and my home the Pic du Midi are the result of a demanding restoration of a barn dating from the 1700s performed under the gaze of my grandfather and my mother. only 200m from the departmental (no noise), secure and simple in winter time access to the cottages is ideal. It consists of two rentals (4 to 12 people if combined), and our home which is a significant advantage for all information on good deals, addresses, walks, hikes, sights and amenities . In order to highlight a development of well-being to our product, a space "Zen" (mid October) will offer you a spa of 5 places, 63 streams and multiple programs; Anxious to bring a notion of calm and appeasement synonymous with holidays, to our tenants. From here several routes are possible, directly, according to the levels and the time allotted. Once again my presence will allow you to optimize your time and your choices to be in the relaxation and serenity. My advice will be right and appropriate to your expectations. In any case I would be intrusive. Your traveling companions are of course accepted in our establishment, without forgetting that the surveillance, the control, the safety (pastoral zone), the hygiene is under the responsibility of their dear masters ... well understood. Our exteriors also include private parking, private terraces, large barbecues (summer / winter), WiFi, TV. The wood-wood winter provided for the inserts / fireplaces. A bus stop is at your disposal for winter trips to La Mongie ski resort. (150 meters> station shuttle stop). Despite my presence on this rental site (the only one), I remain convinced that the first contact with my guests must be at least oral. Simplicity combined with rigor is conducive to healthy and clear communication. My goal: to retain my customers, so as to promote positive exchanges. The result is the "word of mouth", which remains, even today, the most reliable means of communication, a guarantee of safety and trust.